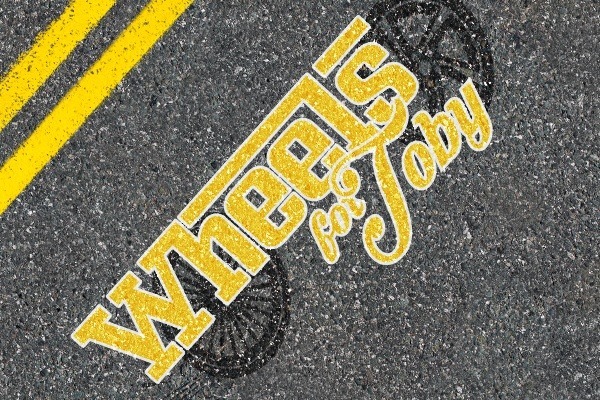 Wheels for Toby supports our friend Toby Lyndon for a customised wheelchair and car. Thirty-year-old Toby Lyndon knows he is lucky to be alive. And so his daily mantra is to make the most of every day of his life. On 10 October 2009, Toby’s life changed forever when he was struck by a train near Wollongong, after attending a mate’s 21st birthday party. He lost both legs, suffered a brain injury, a collapsed lung, and multiple other injuries which left him in a coma for three weeks. Then followed the best part of a year in hospital followed by intensive rehabilitation as he learned to walk again with his prosthetic legs. Despite the pain, the trauma and the frustration, Toby has maintained an incredibly positive attitude to life. 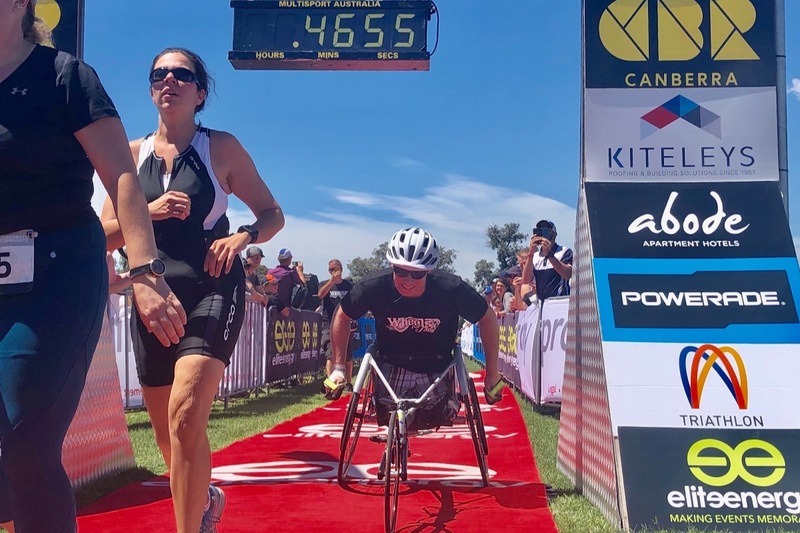 Early this year he moved to Canberra, homeless, but excited to have set a new goal in life, to become a triathlete with an eye to enter elite competitions in the future. 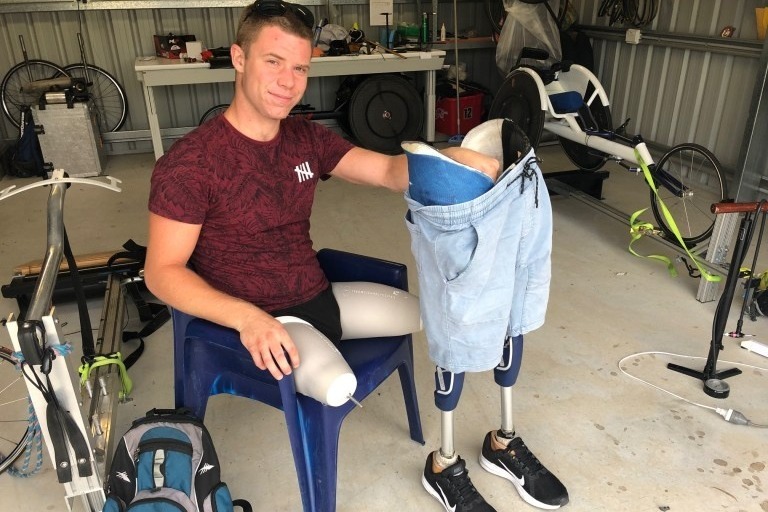 In November 2018, after having a meal and his clothes washed at a service provider, Toby was travelling to find a safe place to park and sleep when his new prosthetic legs locked into his steering wheel and crashing his car into a streetlight pole. 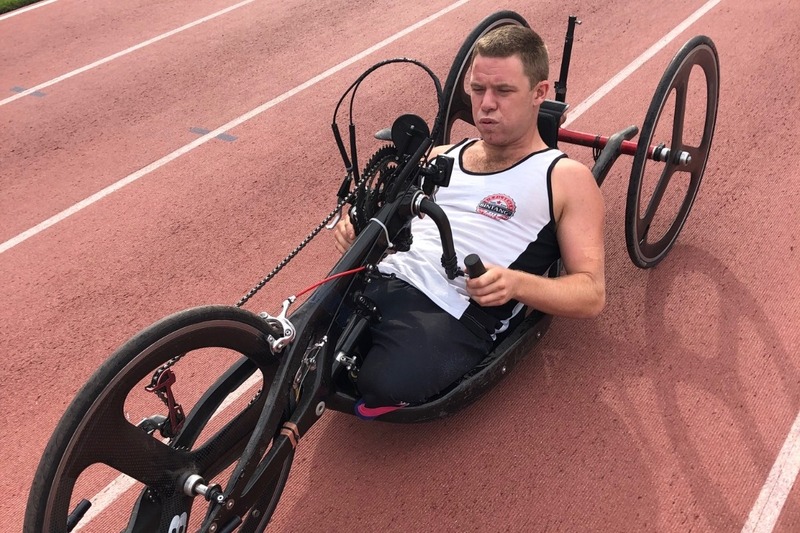 Wheels 1: We are hoping to raise enough funds to buy him a customised wheelchair to compete in the up and coming Proximity Canberra Triathlon Festival, Australia (9 February 2019). Wheels 2: A new car customised to Toby’s needs. Pictured: Toby's home for the past two years was written off following a car accident. Thank you for visiting our page. Make sure you stay in touch by following our social media and website . Please note that when you make a donation, gofundme will ask for a voluntary tip. This helps them to provide a free platform. Thank you. 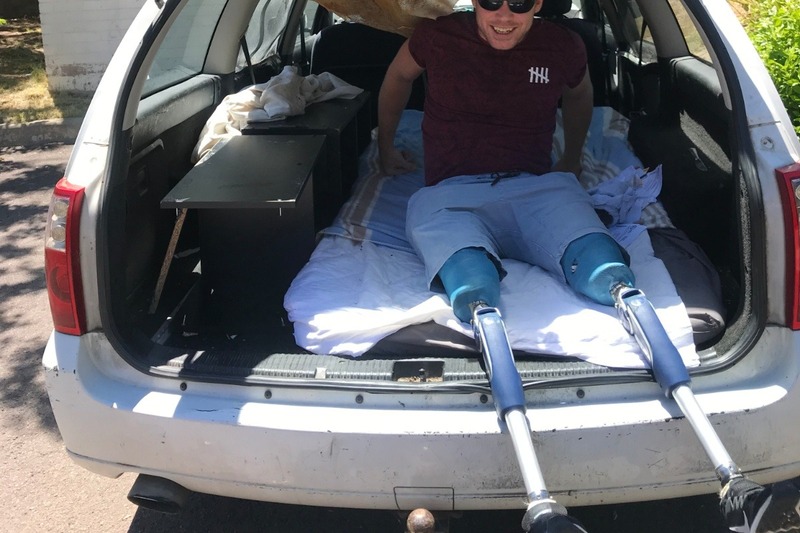 Double amputee Toby Lyndon has thanked the people of Canberra and beyond who’s generosity has helped him purchase a new vehicle to give him back his independence. 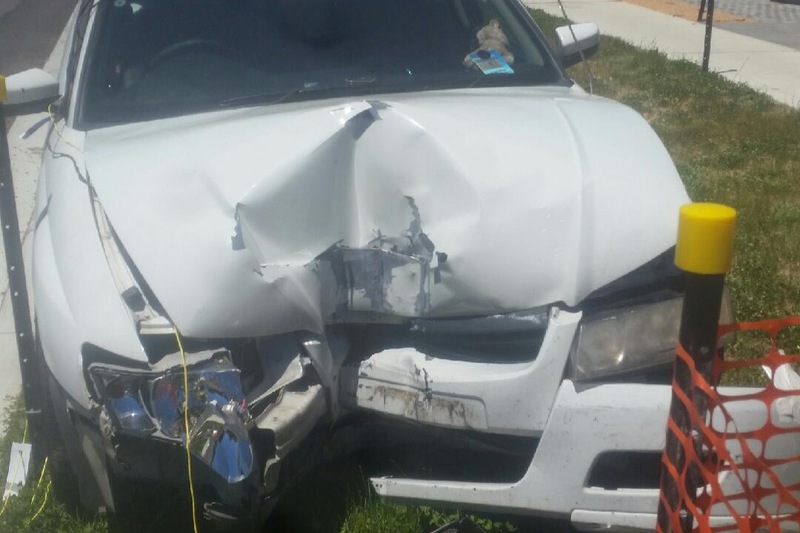 Late last year Toby’s car was written off in a car accident when he lost control and hit a light pole in Canberra’s north. Toby is homeless and his car was his home and helped him get to the Australian Institute of Sport where he is training in triathlon with the ultimate goal of representing Australia. A fundraiser launched soon after by Toby’s friends Noreen Vu and Jeremy Lasek raised $11,690, enough for Toby to purchase a new Holden station wagon. This week Toby will have the modifications to the car completed to enable him to drive again and get his life back on track. In recent days Toby has received more good news. 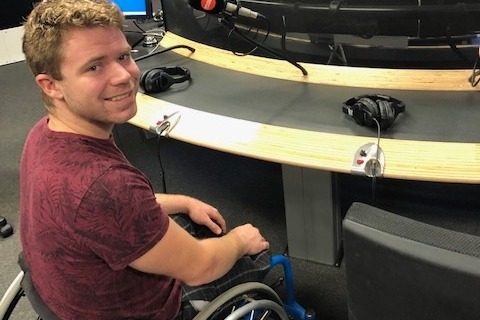 He has been told he has received approval from the Para-sport Equipment Fund for a racing wheelchair to help him achieve his Paralympic goals. 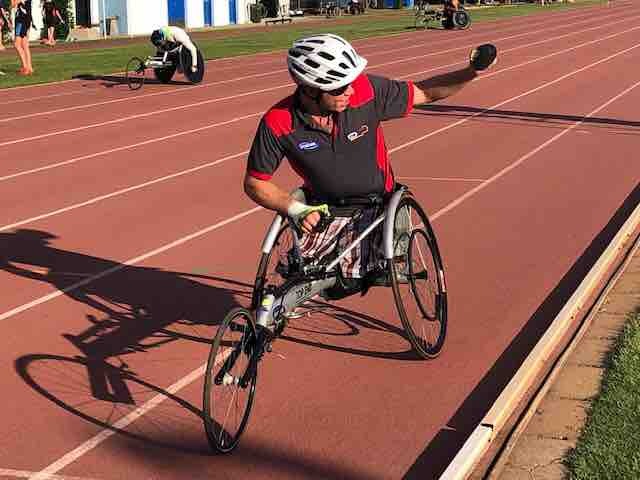 The fund is jointly managed by Parlaympics Australia and Sport Australia and is designed to provide opportunities for Australians with disabilities to participate and compete in para sport by addressing the challenges associated with the high cost of para sport equipment. Fundraiser Noreen Vu expressed her excitement at the result. ‘Toby is a great guy who has had a terrible run of bad luck. To be with him and watch the joy on his face when he took the delivery of his new car was such a wonderful occasion. Jeremy and I add our thanks to everyone who has given Toby a new lease of life. To our GoFundMe donors and supporters, we are so thankful to all of you for making this donation! We will be keeping this page open until 30th April to take any last minute donations to help Toby with the running costs and upkeep of his car. Please pass this onto your family and friends. Thank you! Photo at Toby's ABC Canberra Interview this morning. We are so proud to let you all know that Toby competed in his first triathlon yesterday, at the Proximity Canberra Triathlon Festival. We had two teams compete under Wheels for Toby. The event offered an opportunity for teams to compete as one entry. Wheels for Toby 1 was represented by Cathy, Zoe and Christo Winters (who also kindly donated their Christmas presents to W4T). Wheels for Toby 2 was represented by Nicole McCormack, Neil Stafford and our great Toby Lyndon. Toby took on the "run" section, crossing the line as a double amputee in a borrowed wheelchair. We wanted to send out a big and sincerest thanks to Neil for organising to get Toby's wheelchair he borrowed from the AIS and the other bits and pieces he has done to make the big day. We are definitely one step closer with over $11,000 raised to date. Thank you so much for your contribution. Please continue to share our story! Watching Toby cross the line, pushing his wheelchair along the grass, up the slope, against other able people, really showed us how much Toby puts ABILITY into disability. Had a really fun day today racing, was awesome to be a part of a team of such great people'- Neil, Nicole, Jeremy, Norz and everyone else involved, was a touching experience to race with and be a part of a team with so many selfless, exceptional people. Happy the day went so well without a problem." Yesterday we had the greatest privilege seeing Toby Lyndon race at the GIO Summer Down Under Series. Racing for the first time. This is Toby crossing the 200m finish line and waving to the crowd. He was very excited to get a personal best time. This is a similar wheelchair we hope to buy Toby! He is currently borrowing one from the AIS. What does a customised competition wheelchair entail? Something that is designed to his body, holds him in, considers the length of his leg stumps and a chair designed to stay in the lane because he can control it better. Please continue to share the story for us. Many thanks, Noreen and Jeremy. This is a message from Noreen Vu, Co-organiser of Wheels for Toby and friend to Toby Lyndon. We have some very exciting news for you. In the coming weeks, Toby will be gearing up to compete in the Proximity Triathlon. He is also challenging himself with some time trials at the Australian Institute of Sport. The reason for my update is that I wanted to make it clear to all you wonderful donors. Wheels for Toby has been set up by myself and Jeremy Lasek. With Toby's blessing. 2) A competition wheelchair so Toby can have a wheelchair fitted to his needs so he can compete at the elite level in Triathlon. The photo I attached was of Toby's old car that is significantly damaged from the front. I just wanted to share with you the great challenges this young guy goes through. Thank you so much for your contribution to date and I hope you can share page to your family and friends. Message requested by Go Fund Me.